The average Class of 2014 graduate with student-loan debt has to pay back some $33,000 … Even after adjusting for inflation that’s nearly double the amount borrowers had to pay back 20 years ago. … A little over 70% of this year’s bachelor’s degree recipients are leaving school with student loans, up from less than half of graduates in the Class of 1994. 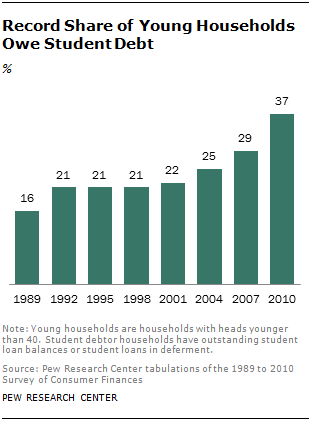 … According to a new Pew Research report, a record 37% of young households had outstanding student loans in 2010, up from 22% in 2001 and 16% in 1989…. 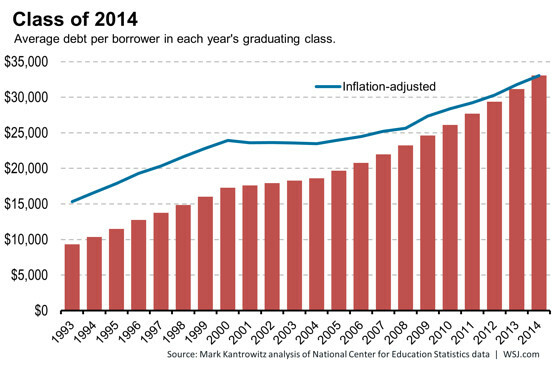 Phil Izzo, “Congratulations to Class of 2014, Most Indebted Ever”, Wall Street Journal, May 16, 2014. 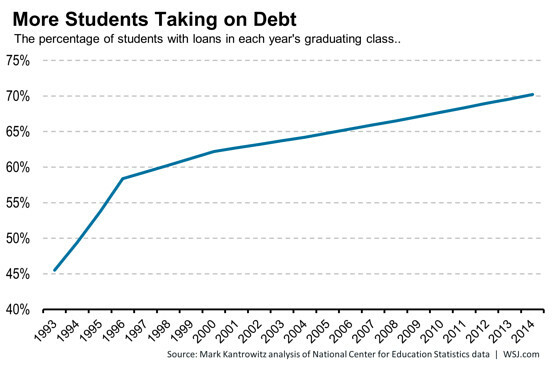 Richard Fry and Andrea Caumont, “5 key findings about student debt”, Pew Research Center, May 14, 2014. Richard Fry, “Young Adults, Student Debt and Economic Well-Being”, Pew Research Center, May 14, 2014.